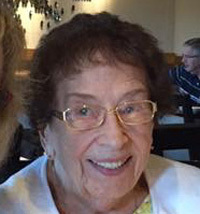 Charlotte C. Porter, 93, of Crossville, Illinois, died Saturday, April 6, 2019, at Linda E. White Hospice House in Evansville, Indiana. She was born July 9, 1925, in Crossville, the daughter of Philip and Susan (Sturm) Fieber. She was married to Jesse Porter and he preceded her in death in 1999. Charlotte was an active member of the Crossville United Methodist Church where she was pianist and organist for over forty years. She had a love for music and enjoyed singing and teaching piano (at no charge) to many students. She worked as a telephone operator and later in various positions at Firstbank in Carmi, Illinois. Volunteering at the Carmi Public Library was among her favorite activities. Survivors include daughters Donnetta (Dennis) Miller of Evansville, Phyllis (Glen) Charlton of Paletine, Illinois; step-daughter Marsha (Mark) Reynolds of Louisville, Kentucky; grandchildren Geoffrey (April) Gwyn, Erin (James) Hart; step-grandchild Robert (Andrea) Reynolds; great grandchildren Maxwell Philip Hart, Christian Jesse (Kelsey) Gwyn; step great grandchild Nolan Reynolds. She is preceded in death by her parents; husband; and brother Philip Fieber, Jr.
Visitation and funeral are Wednesday, April 10, 2019, at Crossville United Methodist Church in Crossville. Visitation is 11 am to 1 pm, and funeral is at 1 pm. Burial will be in Oak Grove Cemetery in Grayville, Illinois. Memorials may be made to the Crossville United Methodist Church and will be accepted at Cook Funeral Chapel in Crossville who is in charge of all arrangements.